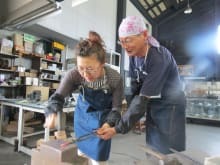 At the Sanjo Blacksmith Dojo, visitors can make tools, such as paper knives and Japanese nails, out of heated iron using hammers. We are looking forward to see all of you! I really had a great time at Sanjo Kaji Dojo. It was my type of experience - away from the popular tourist routs, but still close to attractive spots such as Sado island and Yahiko shrine. My instructor was very patient and fun to work with. The area around Kita-sanjo station is very authentic, with small quiet streets and tiny yards. My advice is to leave the hectic rhythm of the big cities where it belongs, and enjoy the afternoon.